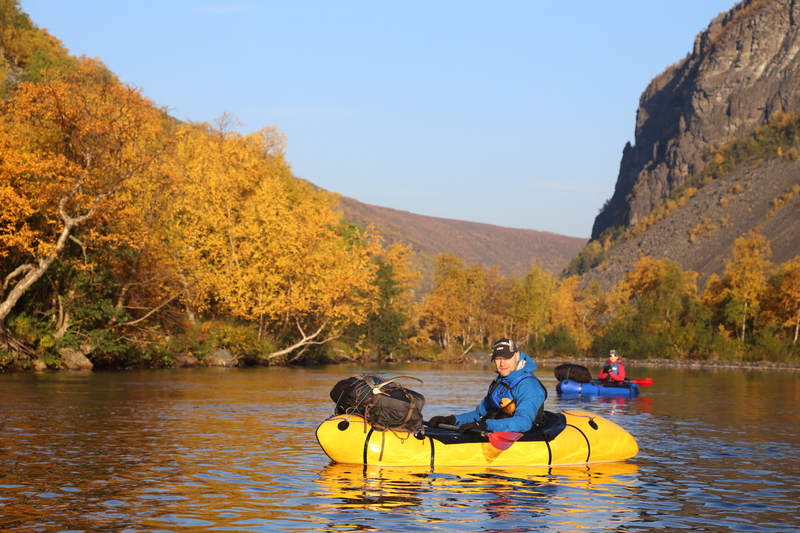 This bilingual post includes some additional details regarding the packraft gathering at 6.-8.10.2017! 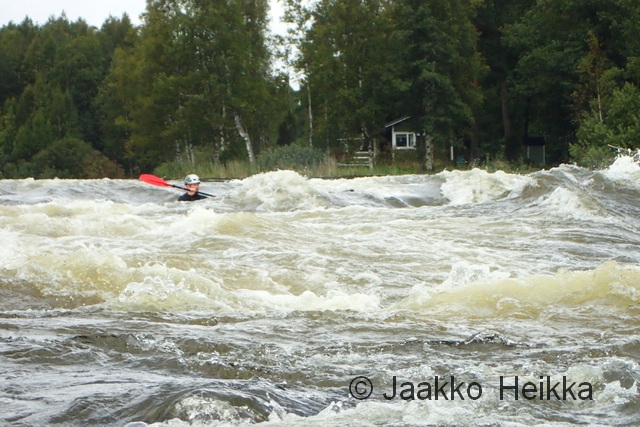 Tämä kaksikielinen kirjoitus sisältää tarkempia tietoja liittyen packraft-kokoontumiseen 6.-8.10.2017! Friday 6.10. Gathering at the parking area of Karkali Strict Nature Reserve (info in English). The address is Karkalintie 1035, Lohja. Next to the strict nature reserve there is a parking area, picnic tables and an outhouse but NO fireplace or dedicated camp site. But there’s plenty of interesting things to see on the area. Please be considerate and follow the rules of the strict nature reserve or utilize every man’s rights outside it. You can arrive by car or walk/cycle from Lohja or paddle from across the lake from Lohja (~15km). Saturday 7.10. Idea is to start from the parking area at 10:00 am. You can also join us in the morning! A short walk from the parking area to the nature reserve where there is a beach to launch our rafts. From Karkalinniemi we will paddle South to Ruosniemenselkä (~8km). From there you can take out and walk to the camping area in Korpudden (~7km) or paddle all the way (total ~20km) to Korpudden. In Korpudden there is a fireplace, outhouse and short nature trail (info in Finnish). No huts or shelters so bring your own! We will spend the second night here. The plan is to share stories of packrafting accidents and close-calls by the fire to learn from others and make packrafting safer. Sunday 8.10. To make it to Karjaa in time, we should start around 09:00 am. From Korpudden we will paddle down the Mustionjoki (Svartån). It is (mostly) flat and easy going with some dams to portage. 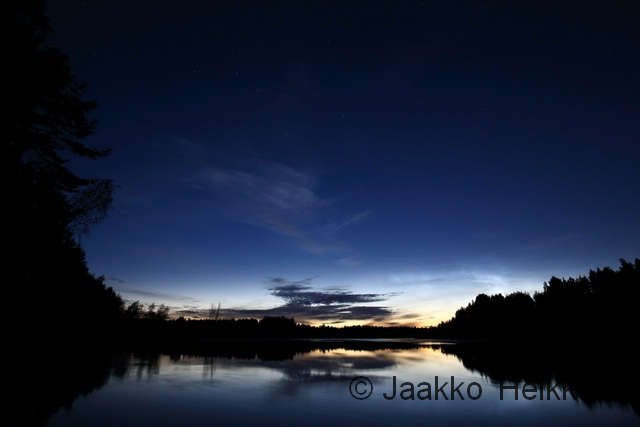 It is one of the “100 pearls of nature” according to the Finnish Association for Nature Conservation (info in Finnish). 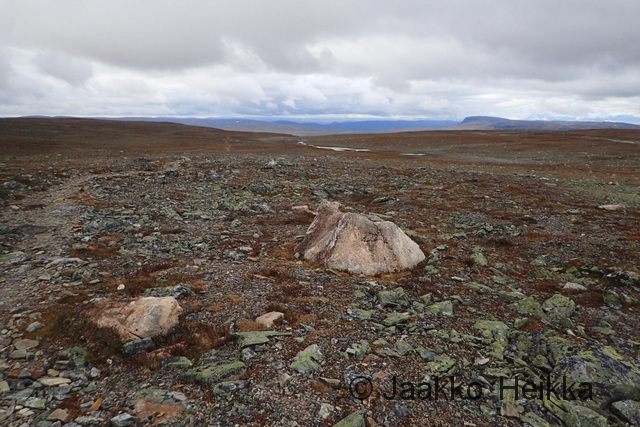 If you paddle all the way to Karjaa, the distance is about 20 km. From Karjaa you can continue further down stream to Pohja or even to Raasepori. But that will likely require another day of paddling. Or catch a bus back home from Karjaa. Car shuttles can be arranged if needed. Best to shuttle the cars on Friday evening or very early on Saturday morning. 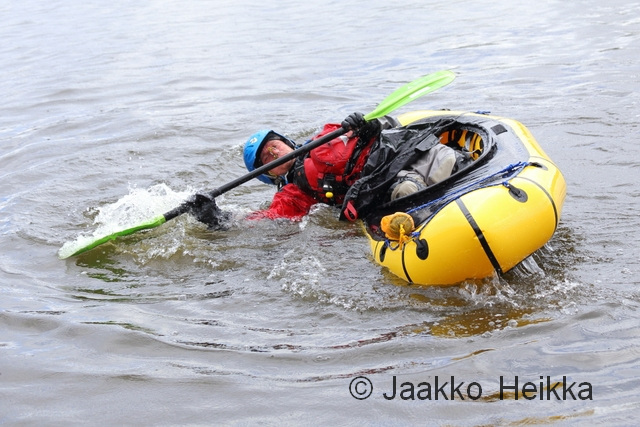 Suomeksi: Suomen packraft-melojat – on taas aika! Perjantai 6.10. Kokoontuminen Karkalin luonnonpuiston pysäköintialueella (info). Osoite on Karkalintie 1035, Lohja. Pysäköintialue on luonnopuiston välittömässä läheisyydessä ja siellä on huussi ja picnic-pöydät, mutta EI tulipaikkaa tai erillistä telttailualuetta. Luonnonpuistossa ja Karkalinniemessä on kuitenkin paljon kiinnostavaa nähtävää. Pidä järki matkassa ja noudata puiston sääntöjä, tai hyödynnä jokamiehen oikeuksia puiston ulkopuolella. Paikalle voi saapua autolla, kävelemällä tai pyöräilemällä Lohjalta tai melomalla Lohjalta järven yli (n. 15km). Lauantai 7.10. Ajatuksena on lähteä liikkeelle pysäköintialueelta 10:00. Voit saapua paikalle hyvin myös vasta aamulla. Kävelemme polkua puiston maihinnousupaikalle, josta aloitamme melonnan. Karkalinniemestä melomme etelään Ruosniemenselän yli (8km). Tämän jälkeen voit joko kävellä (n. 7km) Korpuddenin leiripaikalle tai meloa koko matkan (yhteensä n. 20km). Korpuddenissa on Uudenmaan virkistysaluyhdistyksen alue (info), jolta löytyy tulipaikka, huussi ja lyhyt luontopolku. Ei tupia tai laavuja, joten ota oma majoite mukaan. Vietämme lauantaiyön tällä alueella. 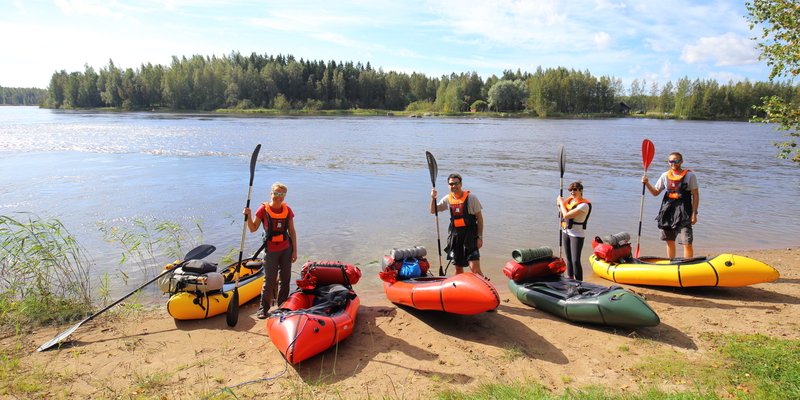 Suunnitelmana on jakaa tarinoita ja kokemuksia packraft-onnettomuuksista ja läheltä-piti-tilanteista iltanuotiolla, jotta voimme oppia toistemme virheistä ja parantaa harrastuksen turvallisuutta. Sunnuntai 8.10. Jotta ehtisimme Karjaalle valoisalla, on paras aloittaa melonta jo 09:00. Korpuddenista melomme Mustionjokea etelään. Joki on helppoa, sileää vettä muutaman voimalaitoksen/padon ohituksella höystettynä. Joki on yksi SLL:n Suomen 100 luontohelmeä –kohteista (info). Matkaa Korpuddenista Karjaalle kertyy noin 20 kilometriä. Karjaalta voit jatkaa edelleen myötävirtaan Pohjaan tai vaikka Raaseporiin saakka, mutta siihen on syytä varata ylimääräinen melontapäivä. Karjaalta pääset myös bussilla kohti kotia. Autonsiirtoja voidaan järjestellä tarpeen mukaan. Autot kannattaa siirtää perjantaina tai aikaisin lauantaina. Edit 8.9.2017: Korjattu pysäköintialueen osoite. // Fixed the address to the parking area. 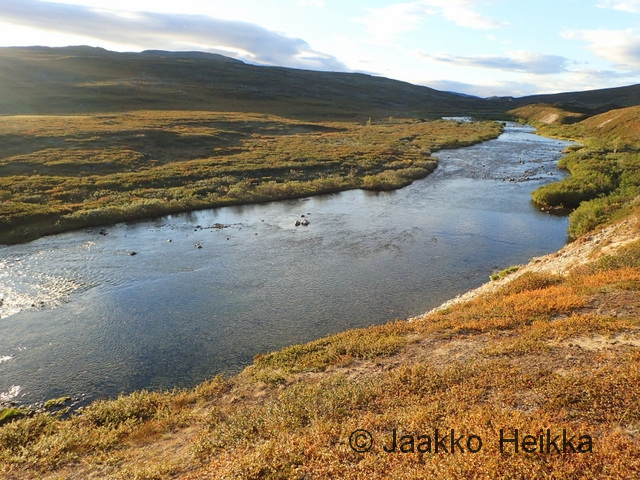 I arrive to the luttle village of Kilpisjärvi late in the afternoon on Sunday 30.8. 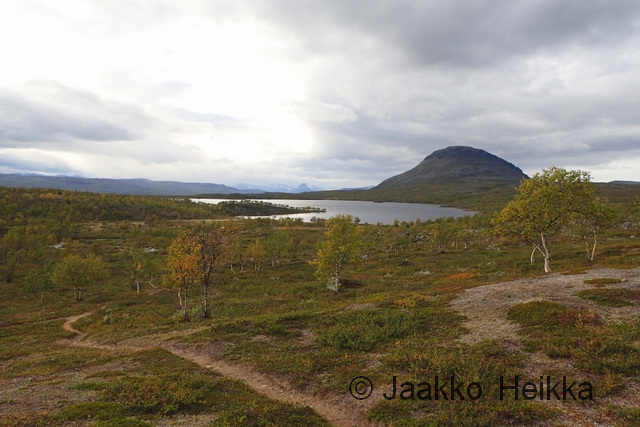 I shoulder the delightfully light pack and start walking along the trail towards Terbmisjärvi hut. I had hoped to have a full day of hiking but work commitments turnnit into only a few hours of daylight. The walking is easy, though my mind is still wandering and occasionally I stumble on the worn and rocky path. It’s quite warm for the final days of August this far North. There are some bugs along the birch woods and I wonder if it was a mistake not to pack the headnet and repellent. But usually you don’t need them this time of the year and once I get out from the bush to the higher ground the bugs are gone and won’t be bothering me again. 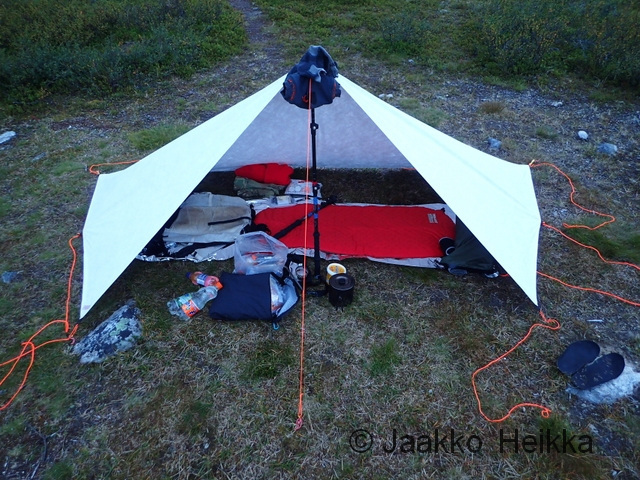 The 16km walk takes little over three hours and I’m pitching my tarp in good time near the Terbmisjärvi hut. The open hut would be empty but I want to see if the minimalistic 3×1,5m tarp actually works for me in open terrain. And with tarp you are way more connected to your surroundings than while in a tent or hut. I cook dinner, enjoy a beautiful moon rise and later admire an owl who soars around my tarp silently and gracefully. I woke up to a drizzle the next morning. The tiny tarp has kept me dry and I’m ready for a new day, even if it seems to be a grey one. With minimal gear the morning chores take very little time and I’m on my way around 08:30. I had planned to follow the valley East and then up thru Kutturakuru pass but with the light pack I’m tempted to head straight over the peak of Jollanoavi (1023m). 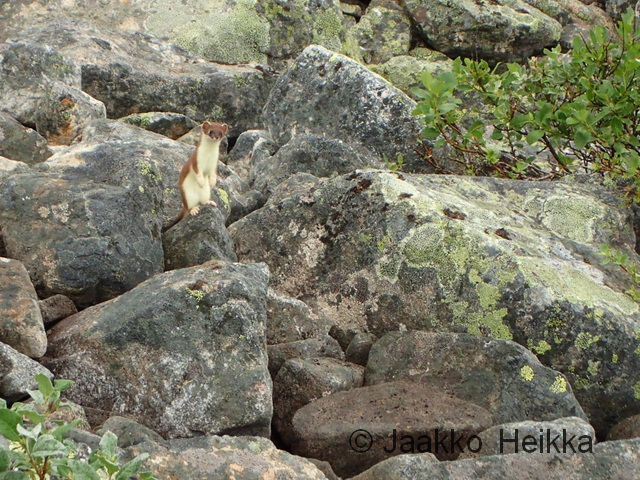 On my way up I play hide-and-seek with a curious stoat (Mustela erminea) before reaching the summit. The clouds mess the views but it’s still nice to be on top of a big hill. It always is. I head down and meet two hikers who by coinsidense happen to be fellow bloggers Mari and Markus. A small world. At lake Japmajavri the sun finds it’s way through the clouds and the views open. It’s beautiful, quiet and I have that good solitary feeling you get from traveling thru remote wilderness. I make a little detour North-East to wade across the Poroeno river from a safe place. Easy but long and cold crossing. Once my feet are warm again I stop for a coffee break. It’s close to 18:00 and this is the first proper break of the day but why stop if you are feeling good walking? Bad bush steers me closer to Valtijoki and I can see my course crossing with a tent pitched on the river bank. I’m not really in the mood for meeting other people but prefer dry feet and easy going over solitude. At he campsite I meet a man who is half-way into his four week solo trip – without food! Instead of food he has a flyfishing kit snd plenty of spices. He has been fishing and foraging for over two weeks and seems to be living his dream: There’s an aura or satisfaction and happiness, and a constant smile. After a longish chat I continue up the Valtijoki feeling happy for meeting the man. 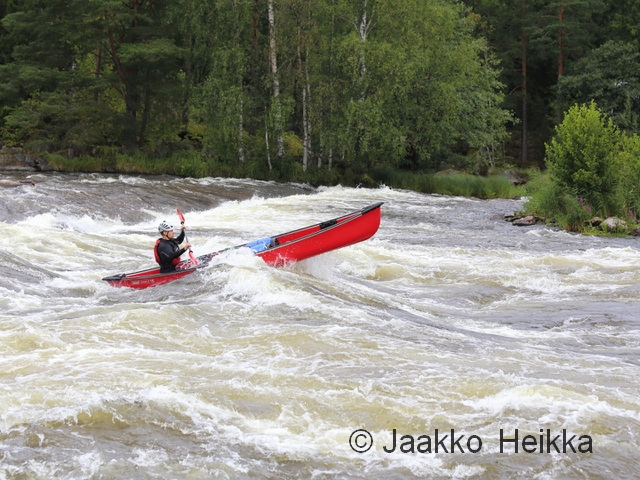 Valtijoki is a beautiful creek and there’s a good trail following it on the sand ridge. As expected, the waterlevel is a lot lower than the last time I was here with a packraft in July 2011. Around 21:00 I find a good spot to camp. There’s some dead wood by the river so I make a small fire to cook dinner and decide to cowboy camp by the river without the tarp. Close to midnight it starts to rain and I find myself hastly setting up the tarp in the dark with a headlamp. Would’ve been a lot easier to do it in the evening… Once under the tarp I fall asleep to the sound of water rushing over the rocky drops of Valtijoki. Over 31 kilometers off-trail in a day makes falling asleep easy but I wake up a few times being cold and adding layers. Apparently the long day has also eaten into my energy reserves. 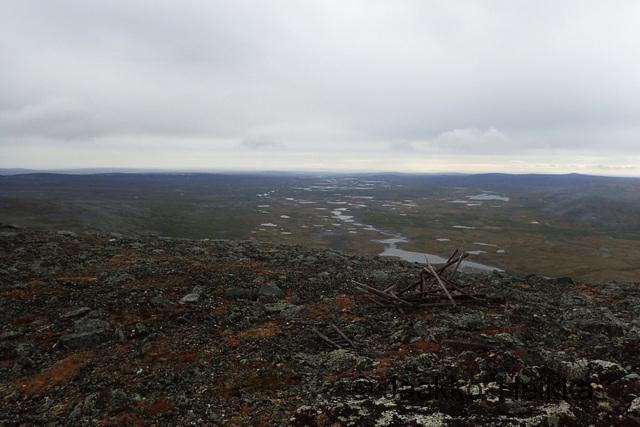 From the hut I decide to hike up to the Ritnicohkka (1317m) which is actually the highest peak in Finland. 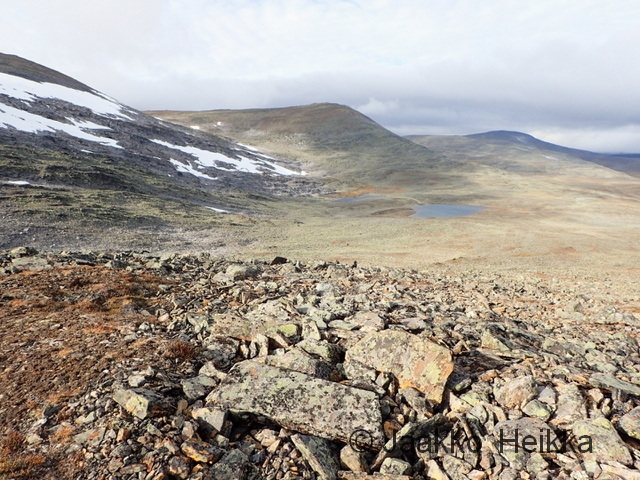 The highest point of Finland is merely a point on the slope of the Halti fjell with the peak itself situated on the Norwegian side of the border. I follow the wide ridge from stellite peak Ritninolka and in the end have to scramble through some steeper slopes. I walk thru a barren landscape of grey rock and over patches of white snow. I sit down, admire the views to North-East and really enjoy being up there. Little later I’m on the summit in the jaws of the relentless wind. 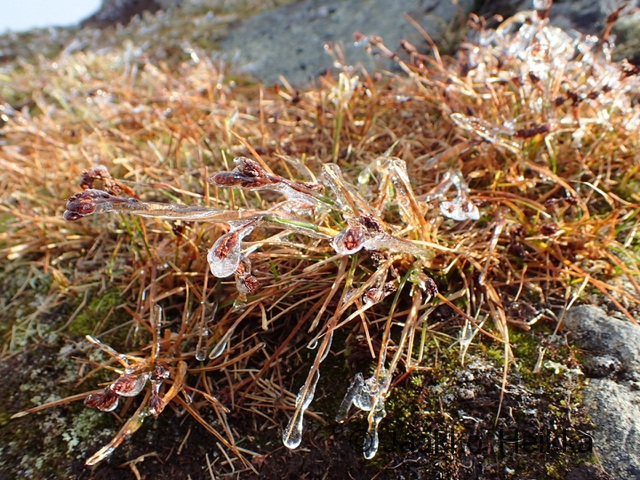 Everything is frozen, the temperature is well below zero and the wind feels very cold. I put on my puffy jacket and seek shelter behind the shed on the top and have a little break taking photos and sending a text message back home. From Ritnicohkka I continue towards the actual summit of the Raisduottarhaldi (1361m), some two kilometeres to North and into Norway from the highest point of Finland. There’s a funny squeeky sound coming from my kit which I can’t localize despite checking my kit for stowaway lemmings. Soon the clouds roll in making navigation difficult and hiding the views. 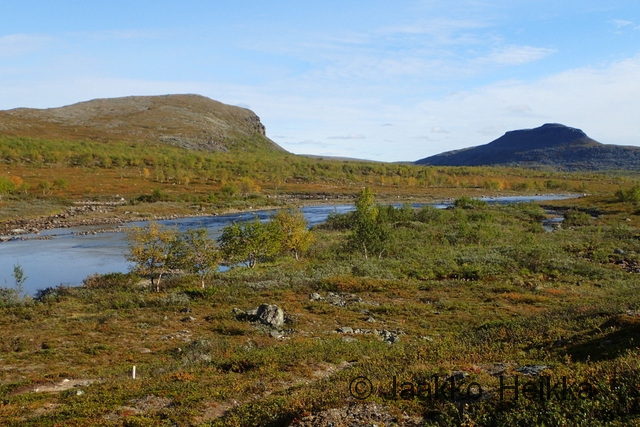 I adjust plans accordingly and head a bit more to the West until I meet the trail leading to the highest point of Finland (1323m) and walk up there to sign the book. No point of going for the actual summit. Near the border cairn there’s a book with a running number for visitors. Even though it’s not exact it gives an idea of the popularity: my number this time is 120066. The last time I was up here was in 2008 and then my number was 91203. Around 30000 vitits in the last eight years. It’s still humid and cold and the wind is blowing. 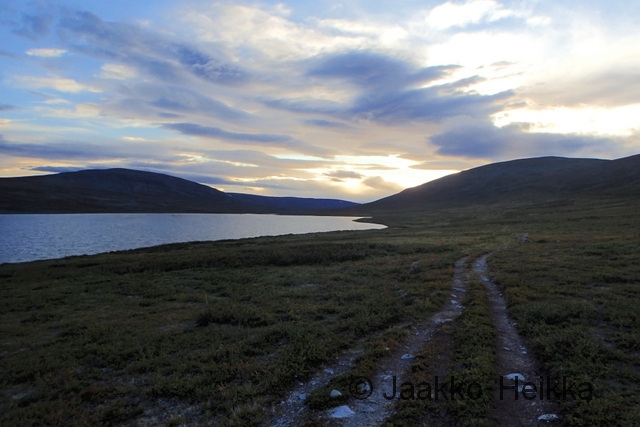 I hurry down from Halti to reach the open huts in the valley before darkness falls. The cozy old little hut seems to be empty so I head there. I really like it. It’s one of my favourite wilderness huts. And as the cold wind keeps on blowing, I’m happy to spend the night inside instead of sheltering under the bit-too-small-for-me-but-very-light tarp. I fetch water from the stream, light a fire in the stove and light the candle I brought with me and settle in while rain patters the single window. It’s warm and cozy inside. This night I don’t mind being little less connected to my surroundings. Going thru my gear in the warm hut I find a reason for the weird squeeky sound that started while descenting Ritnicohkka: the soles of my trail runners are vetically broken between the heal and ball of the feet. They are worn and beaten anyway so it’s not a surprise but it means that for the return journey, I’ll stay on the trail in case of a catastrophic failure. I don’t sleep too well. The hut feels too warm and the wooden platform feels hard as I only brought a thin short pad to save weight. Despite the discomfort I sleep until 09:00. Apparently I’m tired from the long days of walking. After morning chores I’m ready for the final 50km walk to Kilpisjärvi. I have an idea of walking it all in a one go as the trail is reasonably easy to follow even in the dark. My legs feel stiff and tired but soon pick up the rythm and I enjoy the downhill walk in the sunshine. Weather is good, views are good and going is easy. No reason not to enjoy. Around midday I arrive to Pitsusjärvi hut. There’s a man sitting outside on the porch and he greets me with a question: “Do you have cell phone coverage?” It turns out his knees are in bad shape and he’d like to fly our with a float plane but doesn’t have signal to make the call. His brother is up on the nearby hill searching for signal. There’s no phone coverage in the valley but luckily I happen to have my satellite phone with me. I have it for guiding remote ski expeditions and don’t usually carry it on summer trips in Scandinavia but decided to take it with me this time. A happy coinsidence. We wait until the second man returns from the hill. He didn’t have any luck of getting signal so we make series of calls first asking for the number of the floatplane service and then trying several times before getting thru. I have plenty of time to eat snacks and drink coffee. 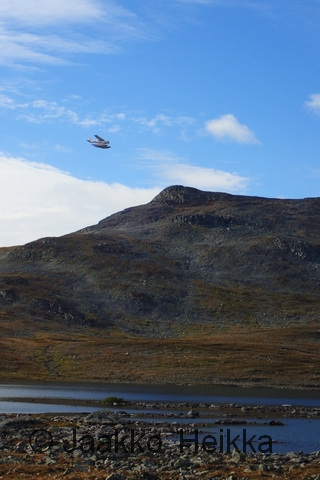 Almost two hours later I depart from the hut and from the Southern end of the Pitsusjärvi lake I can see a small plane approaching the hut and landing near the shore. I’m not too happy for loosing nearly two hours of daylight but I’m happy that I could help some fellow hikers in need. I guess my concentration is not at it’s best as I walk off from the trail and miss a bridge. A mistake I’ve made also back in 2008 in the same place. 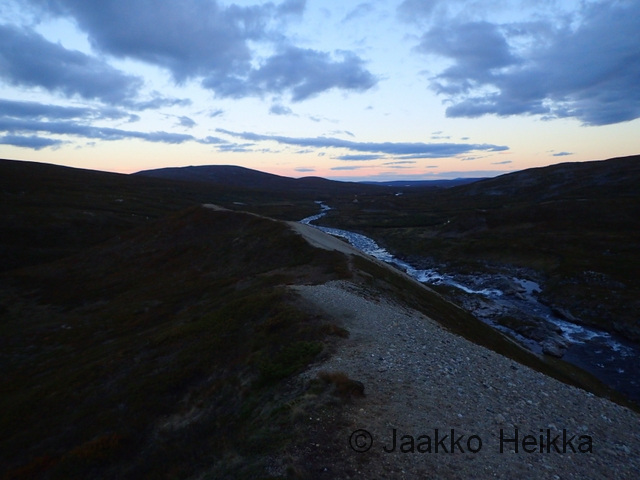 I backtrack, cross the bridge and blaze down the trail towards South and Kilpisjärvi. Near the mighty cliffs of Meekonpahta I notice a lonely rucksack on the side of the trail. I look around but can’t see anyone. 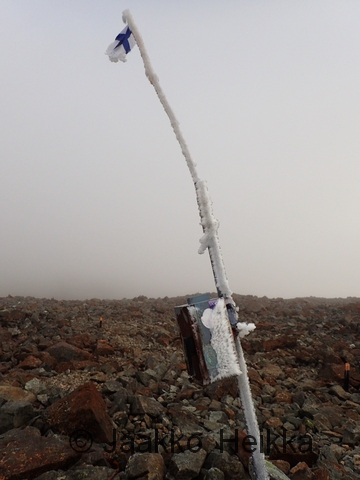 I assume someone has left it there to visit a nearby summit. There’s a short section of duckboards which makes going fast and easy and I soon catch up with a group of four hikers. One of the group is not wearing a backpack but is insted wrapped in emergency blanket. Soon I find out that she had slipped and broken her wrist and they are on their way back to the previous hut. We arrive to the Meekonjärvi hut in no time and I hear that someone has already headed higher to search for signal to make an emergency call. I offer to make a call with my satphone and call to the Emergency response center in Kerava, near Helsinki. 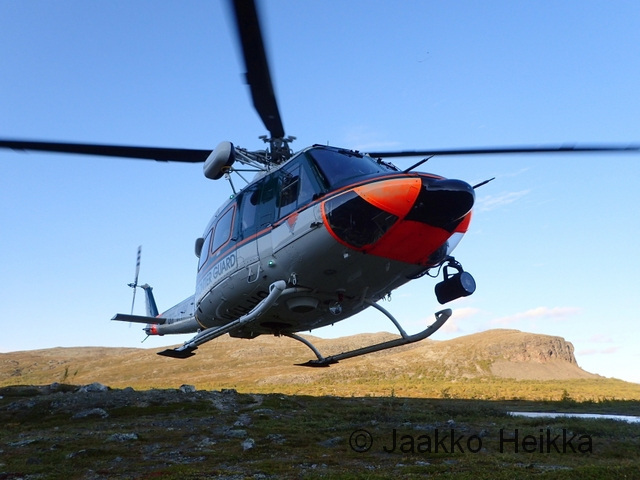 They are first taken aback for me calling to them from Lapland but the normal 112 doesn’t work from a satphone… They reconnect me to the center in Oulu that oversees the Northern Finland and I get to know that a helicopter will be send to get the lady to hospital. In less than an hour a Boarderguard helicopter arrives to the hut, lands nearby and the paramedics go in the hut to prepare the patient for the transfer. I chat with the pilots and the winch operator who seem to have really nice job. They were actually returning from another mission when being alerted here and that’s why they were so fast. 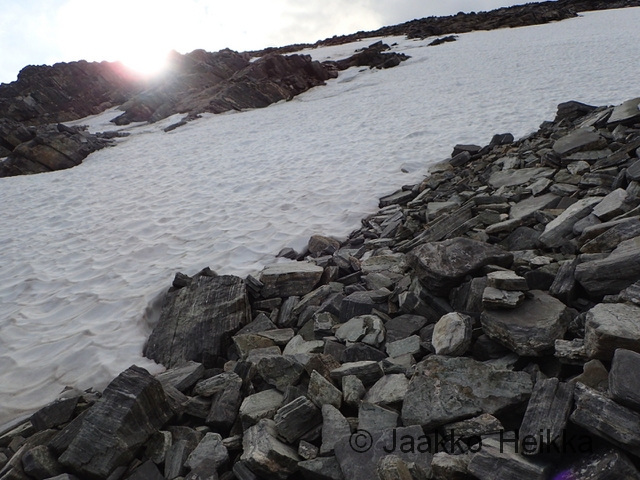 After waving the helicopter goodbye I decide to utilize the little daylight that’s left by walking to the next hut. The walking is incredibly good: The trail is easy. Views are good. The coolness and freshness of the dusk feel good. My feet are light and go on autopilot, the last 100 kilometers have thought them well. It’s already dark when I arrive to the hut so I decide to sleep inside. Instead of a mammoth 50 kilometer day I walked just the normal 30 km but this is how things roll. The night in the hut was again too hot and the platform too hard. Beaten feet on hard wooden platform just doesn’t work. But in the morning I’m ready to continue and get the hike finished. I enjoy a lazy morning reading the guestbook before getting started with the final leg around 09:00. It’s cloudy and I don’t really care for the views. Instead I’m more interested in getting the boring trail walk finished. 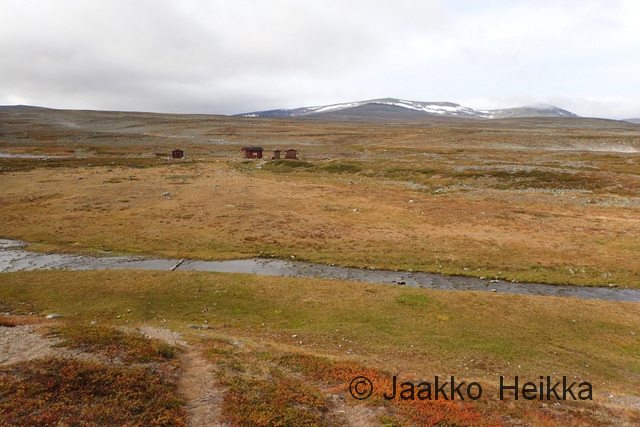 There’s one more hut about midway to Kilpisjärvi and I have a coffee break there. I catch two hikers who left the previous hut earlier and they offer me some proper coffee, which is welcome change for the instant stuff I’ve been drinking. 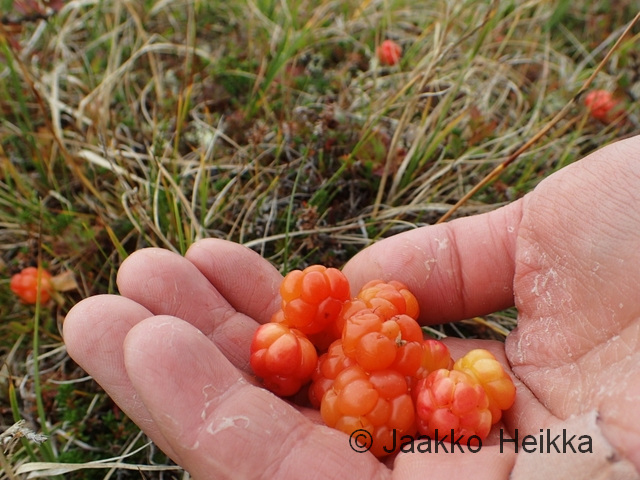 On my way to Kilpisjärvi I find few handfulls of ripe cloudberries and spy a willow grouse family in the birch woods for a while. 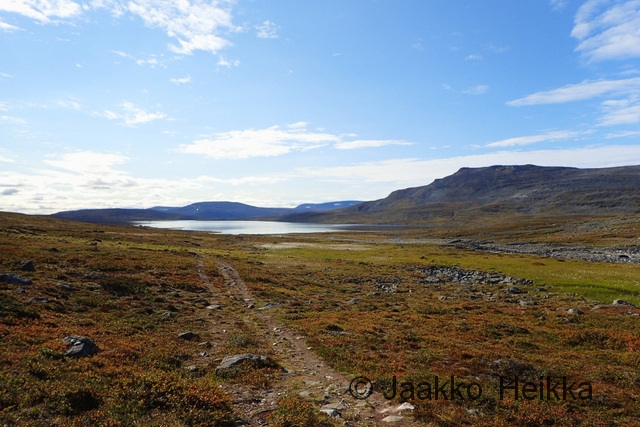 Hiking on the worn trail feels dull and indifferent but when I arrive back to Kilpisjärvi I feel happy and tranquil. I remeber all the good feelings, the beautiful views and the solitude. There’s an aura of satisfaction and happiness. A few additional photos in my gallery. This bilingual post includes some additional details regarding the packraft gathering at 16.-18.9.2016! 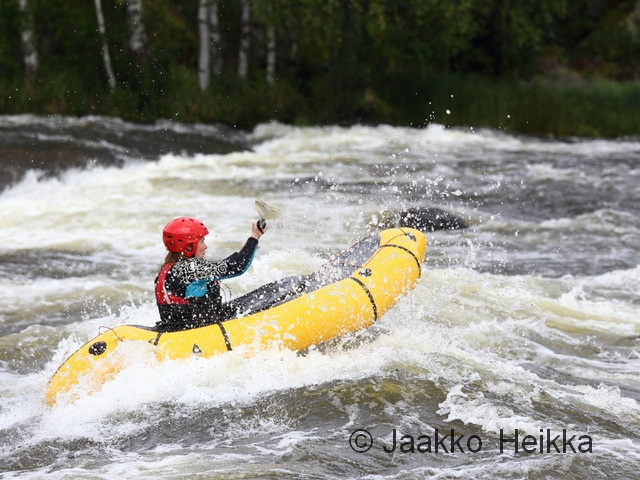 Tämä kaksikielinen kirjoitus sisältää tarkempia tietoja liittyen packraft-kokoontumiseen 16.-18.9.2016! Friday 16.9. Gathering at the Southern-end of the Piilolammi lake at Kytäjä-Usmi area (info site in Finnish) i.e. here. The address is Piilolammintie, Hyvinkää. Parking area is at the end of the public road but the space is somewhat limited so sharing rides is good idea. You can also get close (about 6 km walk) with public transportation. There are two fireplaces at the lake and plenty of room to pitch tents. No shelters or huts. Water from the lake (I’d recommend treating it). You are welcome to join any time you want but Marko and Joni will run a packraft fishing workshop starting around 17:00 and I highly recommend joining for that if you are even little interested in fishing. Bring your own fishing kit if you have any (and take care of the lisences if needed). Evening by the fire in good company. Also nice lake-hopping available for those interested if you arrive early. Saturday 17.9. Walk from Piilolammi lake to Kytäjoki river which joins Vantaanjoki river which we will follow for the rest of the weekend. The day will be quite long (4km walk + 22km paddle) so we will start from the campsite at 10:00 am. You can also join us in the morning! The Kytäjoki is a small river with very little flow. 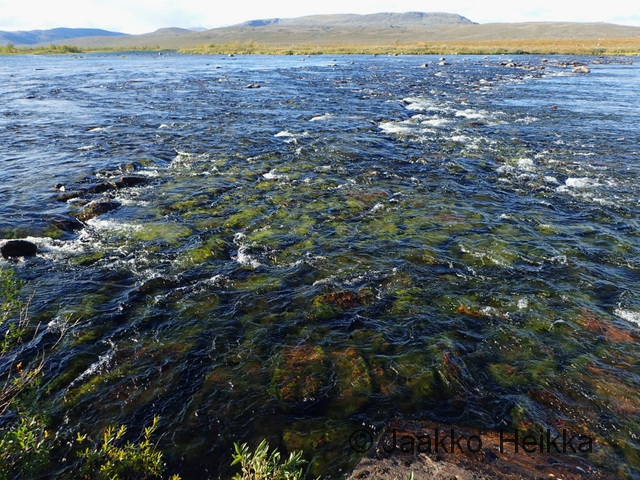 After some three kilometers it joins Vantaanjoki river which we follow down to Nukarinkosket rapids (fishing info in Finnish, kayaking info in Finnish = in brief: requires high water, class III-IV, 25m drop on 1300m). At the moment the flow is not adequate for running the rapids but things might change. Second night at a fireplace at Nukarinkosket. Sunday 19.9. We start again around 10:00 am and packraft further down the Vantaanjoki to Myllykoski rapid (fishing info in Finnish, kayaking info in Finnish = in brief: requires high water, class III-IV, 11m drop on 300m). 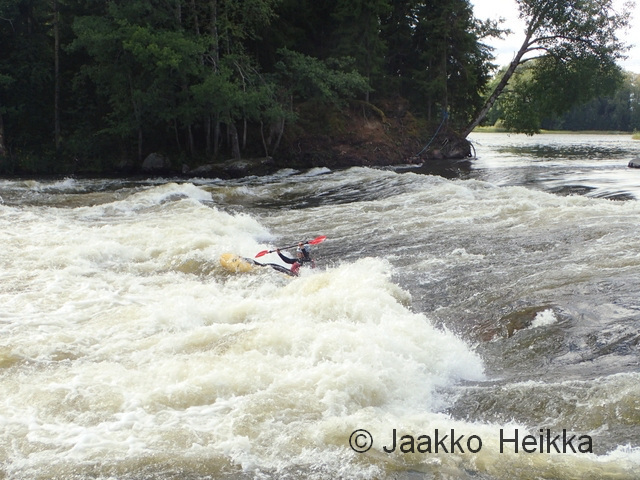 Again at the moment the flow seems inadequate for running Myllykoski but there are some smaller rapdis on the way. Distance is about 13km. 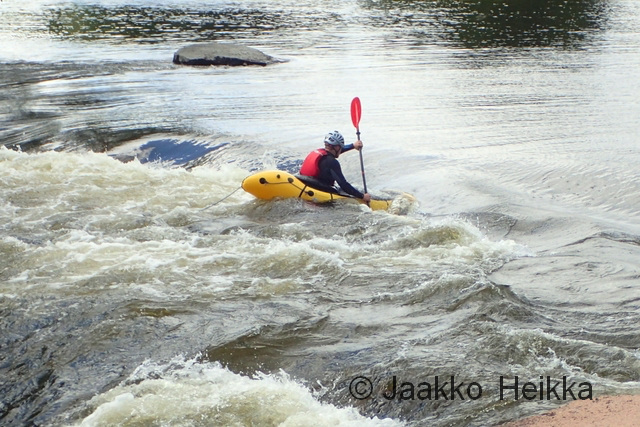 From Myllykoski you can continue further down stream to Vantaa or even all the way to the sea. Or catch a bus back home. Car shuttles can be arranged if need arises. Best to shuttle the cars on Friday evening or very early on Saturday morning. Pekka of pacrkafting.fi has also made a nice map of the route. Update: One of my rafts is also available for rent! Sunnuntai 18.9. Jatkamme Vantaanjoen melontaa noin 10:00 alkaen kohti Myllykoskea (kalastusinfoa ja melontainfoa). Virtaamaennuste ei lupaa hyvää Myllykosken laskemiseen, mutta tilanne voi vielä muuttua. Melontamatka noin 13km. Päivitys: Myös allekirjoittaneella yksi lautta vapaana! Kyselyt sähköpostilla! Update//päivitys 1.9.16: Added Kinahmi rentals. // Lisätty Kinahmi vuokraajiin. Update//päivitys 13.9.16: Added one rental raft. // Lisätty yksi vuokralautta. 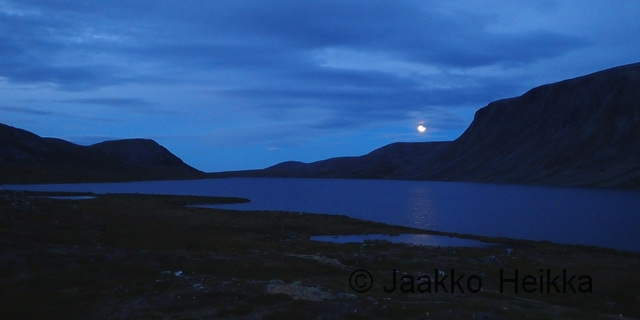 I wrote earlier about our climbing and packrafting trip to Kebnekaise in July. I also promised that there would be a video once Thomas gets it stitched together. In addition to my words and Thomas’ video, you can find more photos from my gallery at kuvat.korpijaakko.fi. And as a bonus, here’s a few photos from the past weekend. 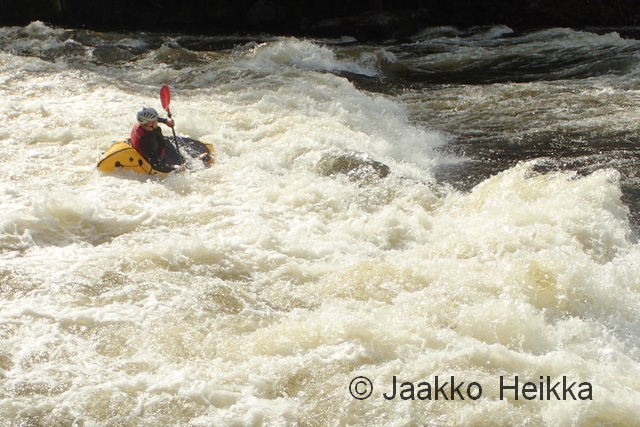 After running one of my packrafting courses on Saturday at river Kymijoki we went to test the packrafts at Pernoonkosket rapids and I also got to rehearse my rusty white water canoeing skills. 170 sqm/s class 2. Notice the 5-meter canoe between the waves? The two pictures below are of my MRS Alligator 2S packraft which I gave for a kayaker to try. He managed to surf it nicely and also did a test roll which worked even without a proper foot rest and with the thigh straps loose. The conclusion was along the lines that: the boat is not a kayak but paddles better than an 85-liter Ortlieb duffel and he might buy one to take it with him when flying abroad to guide. I guess that’s sort of an approval.